When two or more thin layers of beams are fastened together with a bolt or a rivet so that they act as a unit to gain more strength, it is necessary to design the to size or spacing of these bolts or rivets so that it can carry the shearing force acting between each adjacent layers. 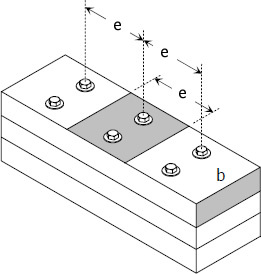 Consider the beam shown in the figure. The effective area covered by each bolt group has a length equal to the spacing of the bolts. The total shearing force F acting between the two surfaces must be equal to the total shearing force R produced by the bolts. where R is the total shearing force to be resisted by the bolts and is equal to the allowable shearing stress × area × number of bolts in the group. R should be taken at the contact surface nearest the neutral axis where the shearing stress is greatest. The spacing of bolts, e, is also called pitch.